After years of research, development and testing, B&W Manufacturing, Inc. has produced the only mid-sized ride on shotblast – scarify – diamond grind – polish machine in the market today. The SCB-1200 w/BH-12 Shotblasting Head Attachment gives you mobility and versatility by being able to switch between heads in just minutes. 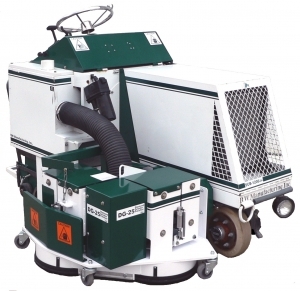 The SCB-1200 features a removable dust containment box with wheels for ease of dumping. One handed operation controls for raising and lowering heads, speed and shot/diamond engage control. The BH-12 Shotblasting Head Attachment is a state of the art blast head design giving you quick blast wheel changes and a feathered blasting edge which enables each successive path to overlap without excessive penetration omitting the “striping effect”. The fin-ished surface is ideal for thin-set applications or for use with clear coatings along with the power to give you an aggressive shot blast profile when needed. The SCB-1600 with the BH-16 Shotblasting Head Attachment has a 16” wide blast path eliminates “zebra stripes”. The BH-16 Blasthead provides a feathered blasting edge enabling each successive path to overlap without excessive penetration omitting the stripping effect which is common to other competitive machines. The finished surface is ideal for thin-set applications or for use with clear coatings. Designed with the operator in mind, the SCB-1600 with the BH-16 Shotblasting Head Attachment uses one control for all machine operations along with power steering, adjustable seat with arm rest and full visibility in front and behind either head attachment. Any operator will feel comfortable running the SCB-1600. With a state of the art scarifying head that is self leveling to automatically adjust itself to different contours of the floor or pavement. You achieve an accurate removal of thin mill coatings to 1/4” overlays. The SCB-1600 with the SC-16 Scarifier Head Attachment is ideal for use on rubber membranes, mastics, epoxy coatings, and line stripes. The SCB-1600 with the SC-16 Scarifier Head Attachment will put you ahead of the competition with its high production rates and large vacuum/collector system that eliminates dust and removes all material from the surface it is scarifying. Versatility is the key to the SCB-1600 with the SC-16 Scarifier Head Attachment. With quick change cages allowing to go from steel to carbide cutters and to different cutting width cages in just minutes.